There is a long record of accurate solar sun spot observations starting about 1600. These number of sun spots fluctuate from a quiet time with very few, 10 or even less, visible sun spots to major activity, up to about 200 sun spots visible on any given day. These follow roughly an 11 year cycle with peaks every 10.57 years on the average, but with as much as 1.5 years variance observed in the cycle length. The cycles alternate with leading North and South magnetic poles. Every other cycle has leading NORTH magnetic poles, and the alternate cycle has leading SOUTH magnetic poles, thus the real full cycle is 21 years, not 10.57. 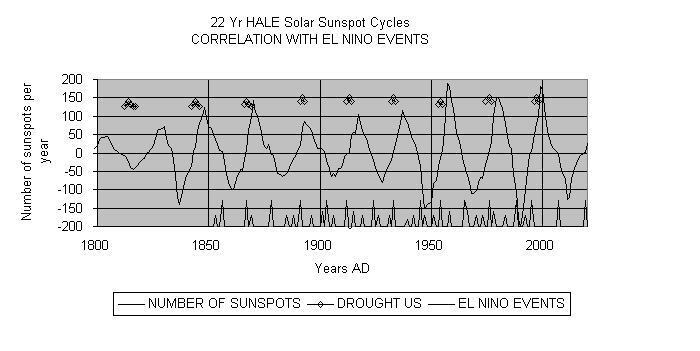 Dr Hale noticed this and he plotted every other cycle "upside down" to graphically represent this "Hale" 21 year pattern. There also was another minimum circa 1200-1300 that is not well recorded. In Europe we have no solar records at all, but Chinese records do partially record this solar minimum. The results were catastrophic world wide. In Peru the Wari culture had such a long drought that the population of the capital city declined form about 50,000 to about 25,000. They literally starved to death. The Mesa Verde Indians in Colorado, now USA, abandoned their entire main cultural site and moved to where they could find enough water. In Europe the cold forced a major change in customs. First the Kings and Queens and then the "Lords and Ladies" moved into smaller, private, warmer bedrooms, instead of living in open, drafty, and poorly heated "Great Halls" of the Castles as was the custom prior to 1200. 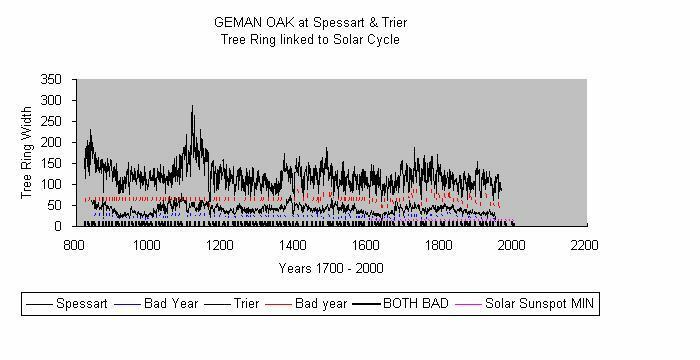 As mentioned before these solar cycles alternate. The spots come in pairs with leading north magnetic poles one cycle and then next cycle leading south magnetic poles in the next cycle; so in order to accommodate and represent this Professor Hale alternated every other cycle above the axis below the axis. This "Hale" presentation follows a 21 year period rather closely. The extreme el niño events follow the hale cycle even closer than the 11 year cycle, and 1976, 1954, 1933, 1912, 1892. and 1866 all were extreme el niño cases with severe droughts world wide. If we add 1997 that will complete the predictive nature of the observation and tend to confirm the hypothesis. El niño events, unfortunately, are not all that well recorded. While I was in Peru in 1996 I went to the national library for two days and made a brief search of the records. Prior to 1890 only very scattered records in personal diaries telling of unusual weather conditions exist. There are no formal records at all. 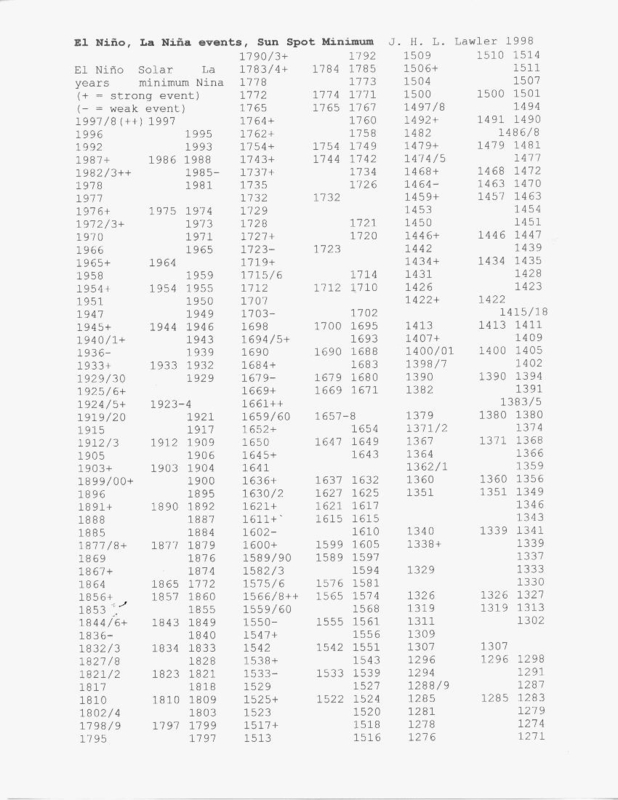 From the other records I was able to add 1878, 1866, 1857, 1842/3, and 1832 events. This needs to be researched better, since I had limited time and could not do as thorough a job as is really needed. But knowing when to look, some of the years el niño is expected, should aid in the research. What happens, and WHY? The sun spots appear to be associated with more energy reaching earth, and solar minima are associated with less heat, or global cooling. The oceans are vast reservoirs of heat for earth and by Le Chatelier's principle will try to react so as to minimize any change in solar heating. Thus the oceans and weather react to release heat from the oceans to the continental masses at minima. In this time Peru receives both more heat and more water. But if Peru gets more water, some other area must get less... in fact most will get less since there is less total energy to produce water vapor. Thus el niño is associated with drought in most places. Australia, areas of Indonesia, the US high planes and the Russian/ Asian steppes all suffer. The monsoons also fail in India. The el niño brings added water from the ocean, to costal Peru and moderation (warming of the coldest months, cooling of the warmer months) of the pacific Peruvian costal climate, but also dumps water causing mud slides etc. in California. Thus it is a truly global phenomena. Because the climate is a global event, we have been able to take tree ring data from logs found in water well and foundations etc. of Roman structures in the Roman times and piece together a coherent picture from living trees back to about 300 BC. Add in few Aurora Borealis sightings and Chinese sun spot records and we have been able to reconstruct (see 5th chart below) a reasonably accurate record of sun spots back to pre-Roman times. Add in teh Brostle Cone Pines and we have a record back to 5000 BC. 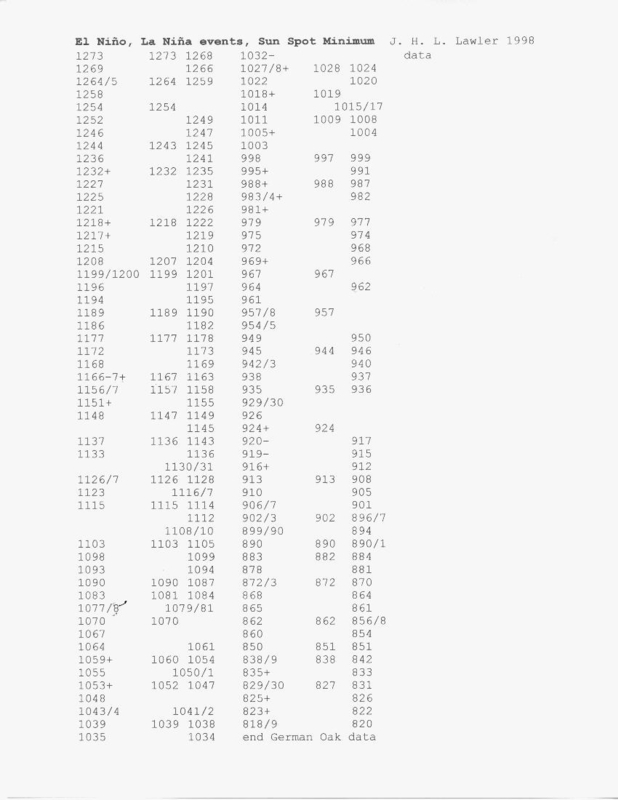 Below is a list of recent el Nino and la Nina events, as recorded present to about 1800, and reconstructed from German Forest data Oak Trees from Spessart and Treir deduced from tree rings with unusually small or unusually large rings adn only where BOTH agreed, i.e. to eliminate local weather conditions. These also agree with the pattern from Chile Trees, from Java and From Bristlecone pines. of California/ Nevada. The below shows solar cycles into the Roman period. These are also including Norse Aurora Borealis , Chinese sun spot observations as well as tree ring data.